This is the third of three posts, exploring the connections between cultural morality, sustainable development, and iconoclasm. – the Brundtland report (introduced earlier in this series, in “Moral Deference of Sustainability“). A couple of decades ago, upon returning to Vancouver from travels abroad, my brother had invited me to stay with a small group who had squatted the upper floor of a Chinese supermarket, in Chinatown, during winter. There was no heating. The rooms, which may have been meant for use as storage areas or offices, were already inhabited by squatters; I had set up my tent to one side of the ‘common area’ (display space) over a well used polyurethane foam mattress core and folded cardboard boxes. This arrangement acted well to insulate me from the cold and from other curious scavengers. The squat had two microwave ovens, standing side by side in the ‘kitchen’. The machines were being made use of by two squatter species; us (Homo sapiens) and them (Periplaneta americana). Preiplanetans were regularly observed perambulating the upper reaches of both microwave oven cavities. Interestingly, they were never observed on the the lower walls or floor/platter. Due partly to the gloomy ambient condition of the ‘kitchen’, and the fact that no observations were performed while the oven was not in use by a human, insects were observed only while the oven was operating, and thus the cavity was lit by it’s own internal light source. It was fascinating to discover that the Preiplanetan colony had made use of warm spots, on the rear exterior and within the ventilation channels of each machine, as ‘preschool’ redundancies. 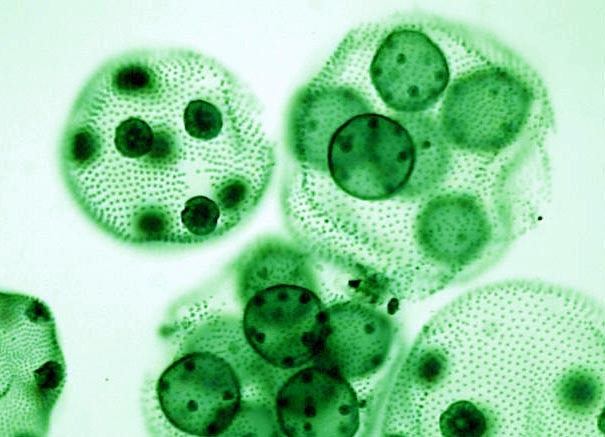 That is to say the colony was making use of physically protected and heated areas of the machines, as incubators for the ootheca and nymph stages of the Preiplanetan life cycle. 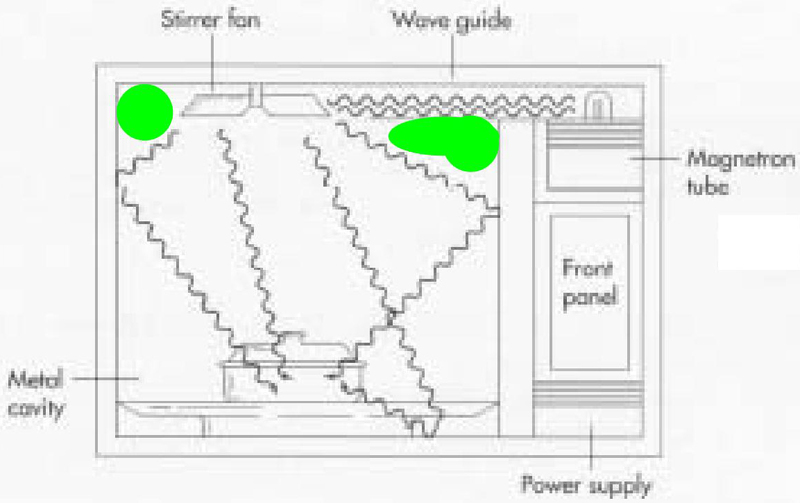 Schematic diagram of microwave oven, showing upper corner areas (highlighted in green) joining the walls and ceiling, in which Periplanetans were observed. 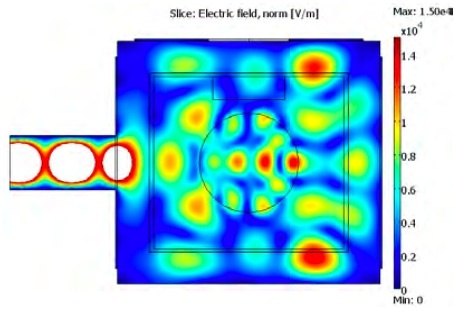 Computer model of a 2D slice, of a 3D electric field distribution inside a microwave oven cavity2. Note the relatively low field density (low power potential) in corner regions. It is surprisingly easy to overlook the significance of what we have encountered here; a convergence of insect population dynamics, human population dynamics, and information population dynamics. However, as we shall see in the following section, population dynamics need not be computable (rational) in order to be effective realities. Synergy is widely misunderstood as a synonym for ‘mystical activity’. Literally, the term refers to cooperativity, and is derived from Ancient Greek σύν (sún “together”) and ἔργον (érgon “work”)6. However, synergy implies an outcome of cooperation that is in principle unpredictable from the action of the cooperating agents. Thus it seems fair to assume that the term represents ‘irrational (non-computable) emergent phenomena’, also known as strong emergence7, and ‘a whole greater than the sum of its parts’. Stigmergy may be interpreted as a rationalized form of synergy, and may be described as a self-organizing and self-regulating process (i.e. 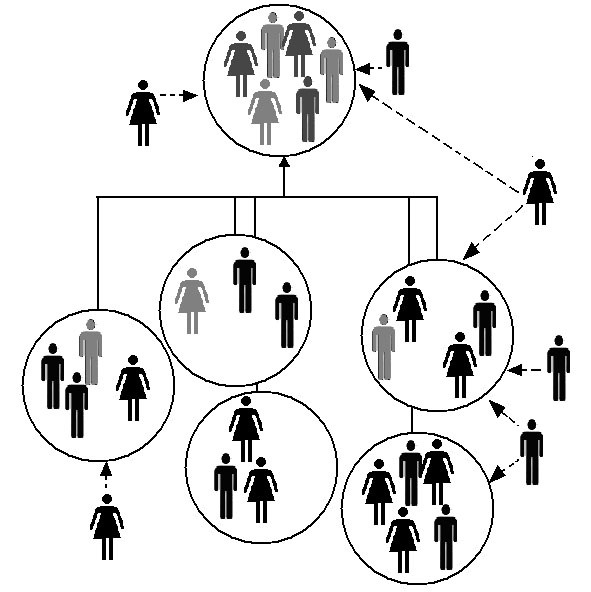 an operational mode) mediated by indirect cooperation between multiple agents8, which collectively give rise to qualitative meta-phenomena not attainable by the individual agents. We had touched upon this concept in an earlier post, titled Governance, under the heading “How does nature govern her systems?”. 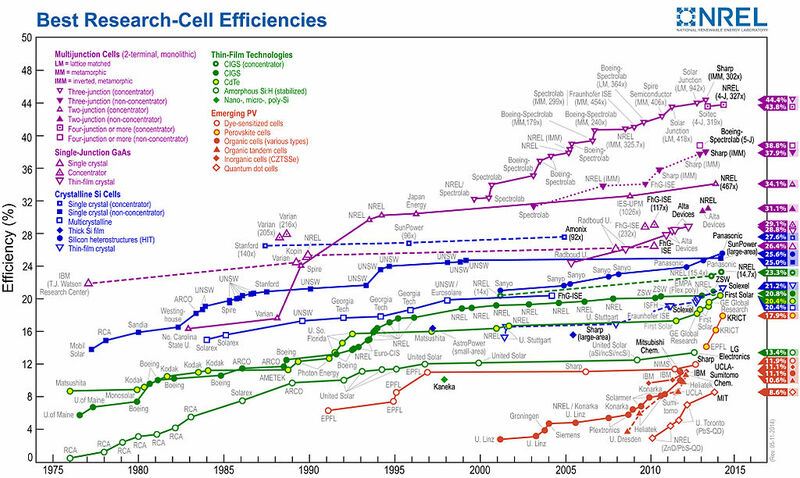 In contrast to ancient photosynthetic cells, state of the art photovoltaic cells approach 45% energy efficiency, but they do not self-organize, adapt, or reproduce. Certainly there seems little hope of them feeding the world. Importantly, the reader is not to assume that the meaning here is entirely antagonistic toward photovoltaic technology. Simply, a trend of increasing energetic efficiency, like increasing gross domestic product, is extremely unlikely to solve any of our existential (environmental) problems. Rather, an entirely different set of thoughts – an entirely different worldview – is necessary. 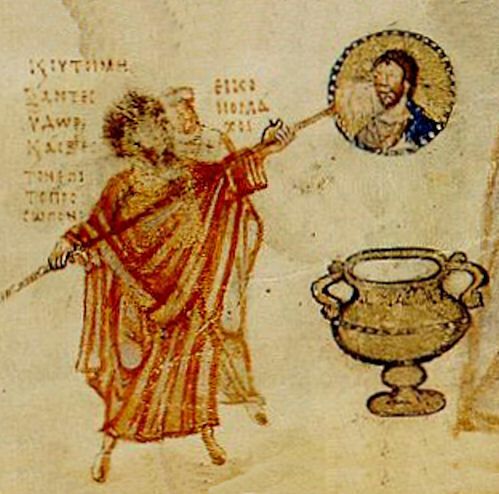 It is precisely at this point in our train of thought that iconoclasm becomes of critical importance. A networked collective of inefficient nodes, even if cooperation between them is indirect and discontinuous, can produce vastly more efficient outcomes than is predictable from efficient operations at the level of individual agents. It does not always compute, may be irrational and thus immeasurable. It flows naturally among and between us; among and between all living things. It flows from Sun to Earth, through water and rock, emerging spontaneously as life … as the Higgs field … as the Aether. It is not, and can never be ‘good science’. The Church of Reason will have great difficulty defining it, though our great House of Arte has always imagined it clearly, and continues to tap it regularly. In our modern culture the image of irrational faith over rational knowledge (see image below) is surely the most difficult icon to break. If you do manage this feat of iconoclasm, then you will see clearly that irrationality is the denominator, and rationality the numerator. Only a fraction of everything imaginable is knowable. This entry was posted in Uncategorized and tagged Blattella germanica, cockroach, egalitarian, emergent, gregarious, irrational, metapopulation, Periplaneta americana, stigmergy, synergy by Bojan Keevill. Bookmark the permalink.